BLOOMINGTON, Minn. – The Western Collegiate Hockey Association (WCHA) announced the recipients of its weekly awards, which are doled out to one player at each position (forward, defense, goaltender) plus one for rookie of the week, for the week of December 28-January 2. 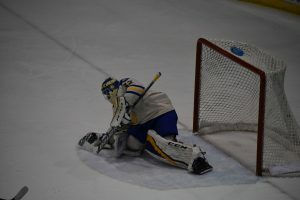 Among the recipients was Lake Superior State goaltender Nick Kossoff. Kossoff, a native of West Des Moines, Iowa, garnered the award when he stopped 48 of 49 shots in the consolation game at the Three Rivers Classic in Pittsburgh on Saturday, December 30. In addition to leading the Lakers to 3rd place, he also made a relief appearance against Robert Morris in the first game of the tourney, where he made 19 stops on 21 shots when he came in to replace Mareks Mitens after one period. In all, Kossoff made 67 of 70 saves, picking up a .957 save percentage on the weekend. The other candidates for Goaltender of the Week were Northern Michigan’s Atte Tolvanen and Bemidji State’s Michael Bitzer, the latter of whom the Lakers will see this weekend at the Taffy Abel Arena. Bowling Green State claimed the other three weekly awards in a weekend that saw them go 2-0 in the Great Lakes Invitational, claiming the championship by defeating Michigan 6-4 and Michigan Tech 4-1. Sophomore Lukas Craggs (forward), sophomore Alec Rauhauser (defenseman) and goaltender Eric Dop (rookie) earned the other awards. This is Kossoff’s second weekly accolade this season, as he was named Goaltender of the Week back in October for his record-setting performance against then-top ranked Denver.